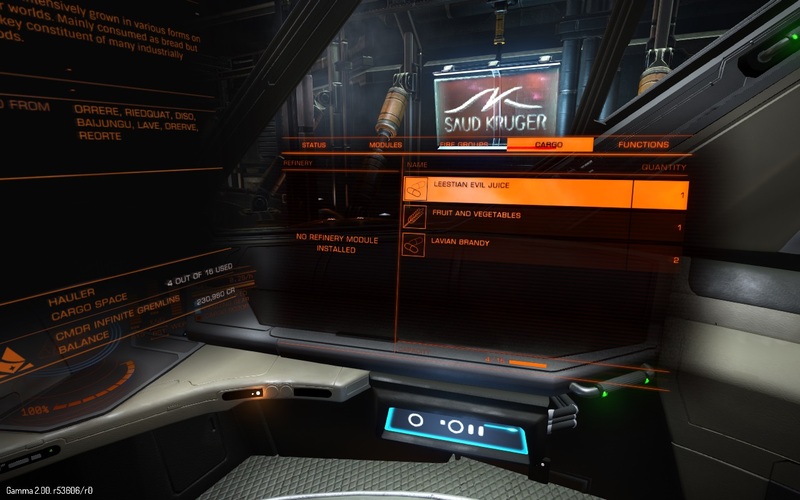 Welcome to the Elite Dangerous Catch-All! For all your space-sim, galactic trucking, bounty-hunting, exploration needs! zero is undoubtedly one of the most prolific contributors to this thread by far. 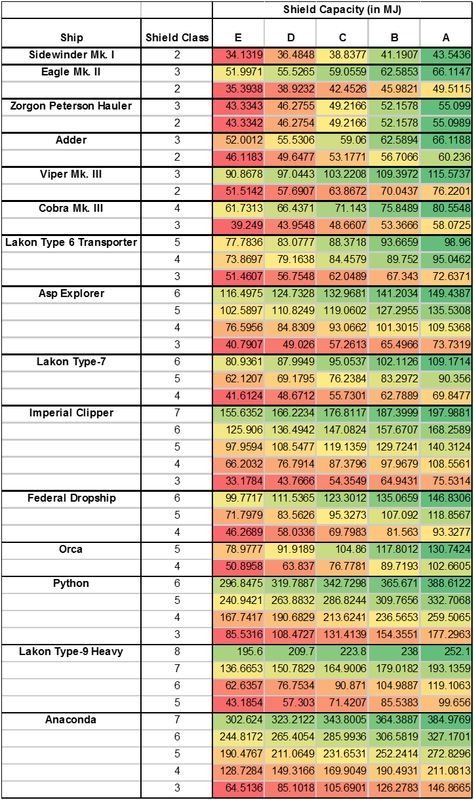 A google doc he maintains for ship builds, tips and tricks is maintained here. Please have a look! Community Goals can fall into several categories (pulled from zeroKFE). Participating in a CG can bring you a multi-million credit payout even from participating in a very minor way. - Selling a specific kind of commodity to a specific station. - Cashing in specific kinds of bounties at a specific station. - Cashing in specific kinds of war bonds (payment from combat zones) at a specific station. 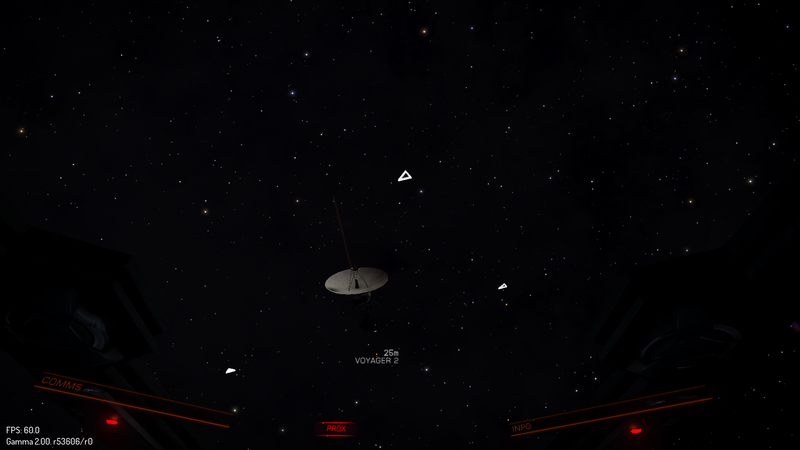 - Turning in exploration data at a specific station. Really interesting AWS re:Invent conference talk about Elite and the AWS back end it runs on. Thanks to athros for posting! Hi-res screenshots was disabled for open play. Apparently the lag it induced could be used as an exploit. Where the hell do I update to the new launcher for 2.0? edit: never mind, they just added a popup now. I didn't see the posted but I just saw on Massively that it has been confirmed that there won't be a wipe prior to launch. Guess it's time to get in the seat and fire this baby up! Yeah, if you get a connection error, even if you think you have the new launcher, click on the link to download the even newer launcher. 1. How in the actual f*ck do you make money at anything other than a snails pace? I've looked for nice pick-up routes on the bulletin board (max 10k on a good run), tried to find a profitable few items to trade around (max 3k) and mining asteroids (3 hours to pick up one half ton of gold... bother). Am I missing something important? Am I that bad at spreadsheets? Is there a place I can go to learn what I should be doing? Seriously, please help. 2. What's this voice command thing? I wanna give that a try. How much cargo space do you have? The Sidewinder can be upgraded to have 8, though you'll probably have to uninstall something else to make room for the second rack. It's hard to make a lot off of 4 tons at a time. An Eagle or a Hauler can do bulk cargo runs more easily, though you sacrifice other things. Missions are also better than trading at the beginning, at least until you can identify some good price imbalances. Finding stuff at a low prices/in supply and selling them where there is high demand is the key to the trading. Either find some place with high demand and shop around for a supplier, or find a place with a cheap supply and shop around for customers. This works best when you give yourself permission to wander, rather than trying to stick around one system. I prefer buying cheap and then wandering to look for a place to sell it, because if you bought it below galactic average there are a lot of potential places to sell stuff. 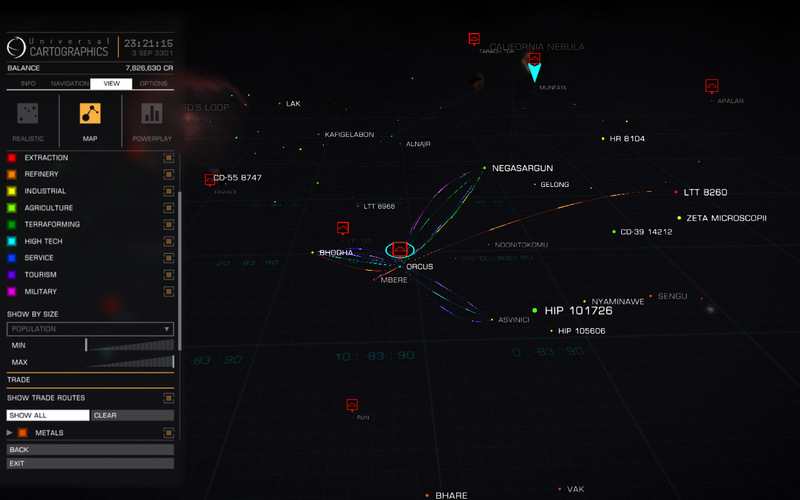 The trade information about imports/exports and the galaxy map trade route display can be outdated or misleading, so don't necessarily rely on that. I have found that if you go to the remote system and they don't have the demand/supply promised, check to see where they get their imports/exports from and that will usually lead you to a good spot. Once you have a medium-sized ship and can make a 150 lightyear run safely, consider finding a planet that sells a unique rare good. They're worth very little near the source, and have huge profits if you go far away. Best for long-range, medium ships: the big haulers can make more by carrying ordinary commodities in bulk over shorter distances, and supplies for rare goods are always somewhat limited, so may not fill up a big ship. Trading - find high population high tech systems. Look for high supply items. Make sure the price is at least 100 below galactic average. Preferably more. Find a system with those supplies in high demand. Pair extraction economies, with refining economies; industrial with high tech, etc. Stay out of low population systems. If there aren't any high demand or low supply items in the market don't use that station. Mining is the most profitable, but it takes a long time to find a good pristine or high reserve ring system. There is supposed to be a setting in the galaxy map to filter by population. You're supposed to look at the edges of high population systems for pristine reserves. I can't verify that. I'll have to go looking for the proper instructions. They were on the elitedangerous reddit. Preorder is in and processing. Will check on it again tonight. Apparently wear and tear has become very fast , very expensive, and increases your scan/interdiction rating by the fuzz. Hoping for a hotfix on that... apparently 40% Wear costs 100K to fix on a Cobra. So I fired up the singleplayer training demo and... I have NO IDEA what I'm doing. This game is attempting to triggering neurons and memories I haven't used in at least 10 years. Tie Fighter was oh so long ago and the last game I actually played with a joystick. What doesn't help matters is that I've played a ton of War Thunder and in that game I'm a decent pilot. So many air combat reflexes have been stamped into my brain that I'm starting to struggle with other games. I was flailing around in Killing Floor a couple nights ago and when I tried to fly an ESF in Planetside 2 it took about 10 seconds for me to hit a tree. This is going to take some getting used to. Do you mouse&keyboard users have any preferences for control setup? On the bright side the game runs okay. I get a little tearing if I move the camera quickly but the game is working surprisingly well on an old dual core. I'm running it at 1600x900 with everything on low-medium and near as I can tell my FPS hovers somewhere above 30. It's definitely playable, especially since the dogfighting action doesn't move nearly as fast as Warthunder with it's +700kph jet planes. I haven't played much with the graphics just yet. I'm in the process of upgrading to a hotrod of an i7 but it's nice to know the game is pretty well optimized. Thanks for that Gremlin and Tactical. I'm in a hauler right now outfitted for mining and that gameplay loop, the burning off ore and scooping it up, is kinda fun to me. I'll get to exploring and start saving for a bigger hyperdrive. Might have to sell that Freagle to do it. So rare goods just got more interesting. I got to Lave with my supply of rare tea and discovered that the market has crashed and I'd lose money if I sold it there. Ditto for some of the system around Lave. I was able to fly to a further system and sell it for 18K/t. The forums are buzzing trying to figure it out what's going on. My guess, based on what I've seen and that some other rare goods seem to be popping up, is that the market at Lave is oversaturated with a bunch of rare commodities and the demand has dried up. My guess is that the increased wear and tear is intended to be a resource sink to bleed off the high end of the millionaire market, and it'll be adjusted again before launch. 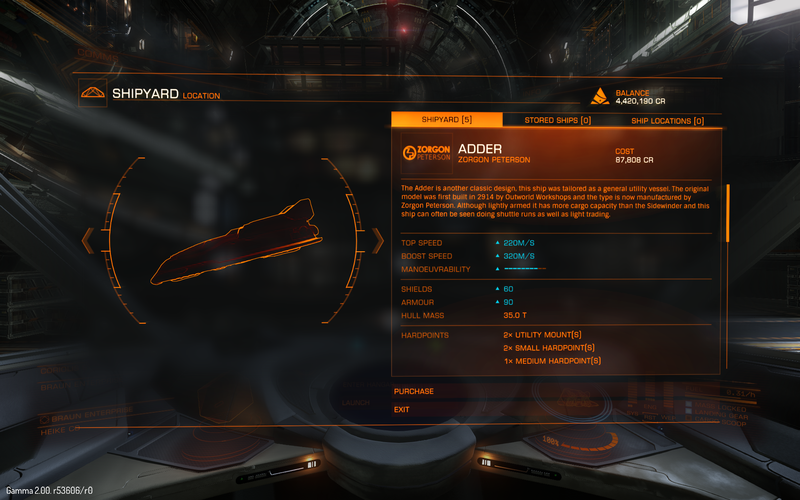 Anyone tried the Adder yet? What's the availability like? I think that's a bug that pops up every now and then. I've seen it once, and I know Orphu has too. In both cases, we just sold our goods at another station (in my case, in the same system) at the usual profit. And on subsequent runs, the sell price at the regular destination was back to normal. Seems like it's a slight upgrade over the Eagle and the Hauler. I just got the combat demo to work tonight, too (although my preorder still says "processing"). What I learned is that I am terrible with M/K, and really need to get my joystick from the basement. I have a lot of respect for anyone who can fly effectively with M/K. Yeah, as deftly points out the rares market being low is a bug. It happened every once in a while in G1, but in G2 it's really common. Flying to another station sometimes works, but the sure bet seems to be just wait it out. The market resets every 10-15 minutes, and both sell price and stock will pop back to normal. Thanks Deftly. I might pick one up tonight, looks like a decent allrounder until I gather my Cobra money together. Can anyone recommend good armaments for a a Cobra? I'm doing alright with quad burst lasers as the old beast doesn't have the turn radius to stay on someone's tail and I need to get the big hits in when they show themselves but I can't help thinking I can do better. I'm seeing a lot of love for 2x C3 gimballed autocannon and 2x C1gimballed burst lasers. I assume the lasers are for shield-stripping and the autocannon for punch. I assume the lasers are for shield-stripping and the autocannon for punch. Pretty much. The ships with low amount of hardpoints are limited in effective combinations, so you'll see autocannons and lasers as a common loadout. I've been using 2xACs (size 2, gimballed) and 2xBeams (size 1, non-gimballed) in a Viper (same wep config as Cobra) with good success. Can anyone recommend good armaments for a a Cobra? The Cobra benefits well from thruster upgrades. They're more effective the lighter your ship, so if you want a really fast turn radius try to run as light as possible. The best fighters are pretty much stripped down to only what's required for fighting (every ton matters). Some people even use a smaller size fuel tank, or run it half empty, to save tonnage. Thruster upgrades, good thinking. I think I found some at a station somewhere but it overran my power requirements so needed a plant upgrade first. I'm not going to set my Cobra up as my main combat ship as I like having a jack of all trades loadout. I'll probably buy a Viper for pure combat. As for the weapon combination do you alternate between the weapon groups (lasers until the shields are down then switch to guns), or do you alpha strike the whole lot? Looks like the 'secret' was found already..
Nice, since you can fit two lasers that looks like it would make a better mining ship start than the hauler I've been using. Should speed up getting your chunks knocked off.